Portraits of hip-hop legends, like your favorite producer 9th Wonder, mixed with emerging Carolina talent lined the walls of the downtown Durham alley flooded with people filing in to see the "Don't Wait Till it's Cool" (DWTIC) exhibit, a photography exhibition that features the works of fifteen NC photographers who have captured NC hip-hop. 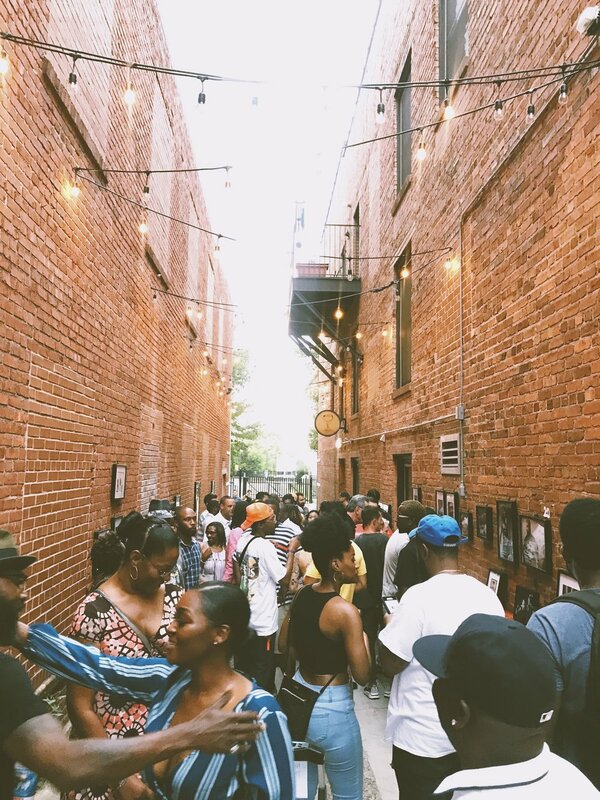 Brought to you and curated by NC Always, the exhibit first displayed in Charlotte, NC and followed up in the heart of the Bull City at a very intimate location outside of Alley Twenty-Six in an actual...well...alley. "Don't Wait Till It's Cool to Rep the Carolina's," a quote from Charlotte rapper Elevator Jay, also included in the exhibition, is where the touring show got its title. The works of fifteen photographers who were featured in the exhibit included Orchid Chamblee, Joseph Headen, Johnny Lee Chapman III, Saloan Goodwin, Chris Charles, Blaine Butler, Tre Bravo, Phillip Loken, Will Jenkins, Tory Silinski, Myles Harris, Kevin “Surf” Mitchell, Dj Pauly Guwop, and Dave Butler who collaborated with the creator of NC Always to make this happen. It consisted of a numerous artist from North Carolina's hip-hop scene ranging from 9th Wonder, Rapsody, Phonte Well$, Deniro Farrar and more. You can see the full photographer and artist list pictured, which brings me to my favorite part of the entire exhibit. I was in love with the details Chanel Nestor, the curator of DWTIC, considered when creating this space for black creatives. Photo albums that included hip-hop artists at local venues were placed outside for people to skim through. And every photo included in the exhibition had a song to go with it, forming an entire playlist, that can be found here on sound cloud. "Don't Wait' Till It's Cool" is a great example of why black curators are important in preserving our culture. The creator will also be a part of the "Curating Hip Hop Panel" at the 4th annual 20SDS to give her take on this, Saturday, August 11 in downtown Winston Salem. You can visit 20SDS.snootyjudy.com to get your tickets to hear what the founder of NC Always has to contribute to the conversation. To find out what NC Always has going on next make sure to follow them here on Instagram.